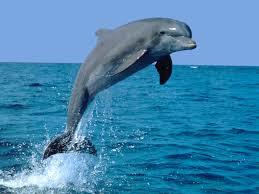 The Florida state saltwater mammal is the dolphin or porpoise. Is it a porpoise, or is it a dolphin? Even the 1975 Florida legislature left the issue open, designating the “porpoise, also commonly known as the dolphin,” as the official saltwater mammal. The terms porpoise and dolphin are sometimes erroneously used interchangeably. Usually in Florida both names refer to the Bottlenose dolphin (Tursiops truncates), the species commonly found along Florida’s Atlantic and Gulf coasts. (True porpoises are a different saltwater mammal and are not commonly found in Florida waters.) Dolphins are gray with a lighter underside. They can live to the age of thirty and most are six- to eight-feet in length. Dolphins use a system of echolocation, much like sonar, to determine their orientation. They have no sense of smell. Their keen eyesight, remarkable hearing, and wide variety of sounds (barks, clicks, and whistles) make dolphins especially interesting to study.